The only sign, initially, could be soreness on the thumb side of the arm, near the wrist. 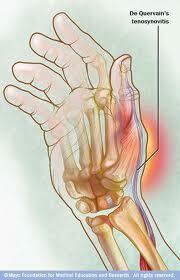 If the problem isn’t treated, pain may spread up the forearm or further down into the wrist and thumb. Mild to moderate cases may experience pain with, or be unable to perform, writing, infant and child care, office tasks (e.g. filing or keyboarding), lifting items like books or milk cartons, performing ball or racquet sports, or other tasks requiring sustained or repetitive use of the thumb, or grasping/lifting involving the thumb. Several complications can happen if you don’t seek immediate treatment for de Quervain’s Tenosynovitis. Physical therapy is the initial treatment for this syndrome, and a very important one. Recurrence of the symptoms is very rare. 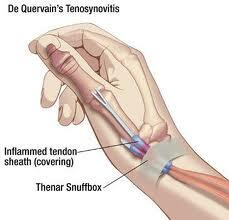 A Patient’s Guide to: de Quervain’s Tenosynovitis. Chiropractic Performance & Sports Therapy Center. 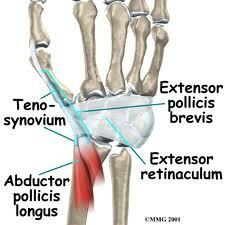 Fact Sheet: de Quervain’s Tenosynovitis. Wesley Hand Centre. 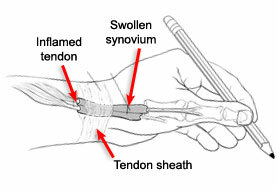 de Quervain’s Tenosynovitis (2002). American Society of Hand Therapists.